Mopeds and scooters are popular means of transport, often used by young people aged 16- 21 years and as an economical means of travelling to work, college or university. When can you ride a moped or scooter? A moped up to 50cc can be ridden on L-plates by a person aged 16 years and older, who holds a UK driving licence and has passed a CBT (Compulsory Basic Training) test. A scooter of up to 125cc can be ridden by anyone of 17 years of age, again after passing a CBT test. • If you obtained your car licence before 1 February 2001 you do not need to complete a CBT to ride a moped. You’ll move from one element to the next when your trainer is happy you’ve learnt the theory and demonstrated the practical skills to a safe basic level. When you complete CBT to at least the minimum standard, you’ll get a certificate of completion – also called a DL196. This certificate of completion lets you ride a moped or a motorbike up to 125cc on the road with L plates for two years. You have to take your full motorcycle test within a two year period, or have to take the CBT again. 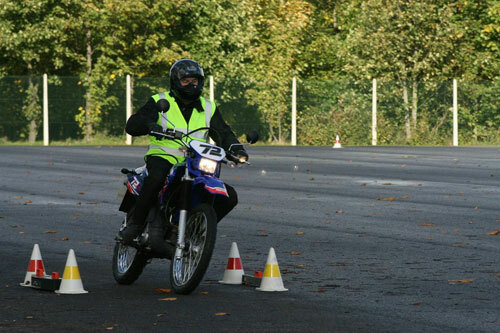 Passing a CBT test and getting onto the road is only the first stage of becoming a safe and competent rider – this only comes with time and experience. Moped and scooter riders are extremely vulnerable on the roads, and unfortunately they feature all too frequently in killed or seriously injured casualties. Riders need to be extra cautious and learn to share the road. Safety is the single most important thing to consider when riding a moped or scooter. Set out below is a series of key pointers to help keep you safe while out and about. • Safety is paramount – always be responsible for your own safety and that of others. • Ride safely and responsibly – ALWAYS be alert and observant. • Remember that mopeds and scooters are vulnerable – they don’t have the protection offered by a car. • You are vulnerable to car drivers’ blind spots – position yourself to be seen; avoid riding close to the kerb. • NEVER be complacent – anticipate what other road users are about to do and know what to do when they do something unexpected. Take particular care in bad weather and at junctions and roundabouts. • Check over your shoulder before making a manoeuvre – this is often called a ‘life saver’. • Ride at a speed appropriate for the conditions and which allows you to slow down before trouble. • Watch for hazards and changing road conditions. • Be especially careful in bad weather conditions e.g. when it is raining, foggy or icy and reduce your speed accordingly. Bad weather often means reduced visibility. • Don’t tailgate other road users – you will be difficult to see and you will be in danger in the event of a sudden stop. • Take extra care when riding in a group. Crashes often occur when riding in a group, taking extra risks when trying to ‘keep up’ or under pressure to race or show off. • ALWAYS wear a helmet and have it securely fastened; take care when choosing a helmet – make sure it fits securely. NEVER use a second hand helmet. • ALWAYS wear suitable protective clothing, no matter how short the trip. What you wear when riding is the ONLY thing protecting you from impacts and the surface of the road. • Riding without protective gear is a risk NEVER worth taking. Many riders resist wearing motorcycle clothing because of cost, inconvenience, comfort and lack of knowledge. • There is no difference in coming off a scooter at 25mph or a motorcycle at the same speed. Scooter riders have exactly the same chances of suffering serious injuries such as broken limbs and extensive skin abrasions requiring skin grafts – or worse. It is easy to find good protective clothing suited to personal style and tastes. • Always wear a motorcycle specific leather or textile jacket, preferably with built-in body armour, to protect against impact and abrasion injuries in the unfortunate event of an accident. • Never ride without specialist motorcycling gloves. The first thing you do in a crash is to instinctively put out your hands for protection. Skin can be removed from the hands in less than a second, so protection is essential. Offer a degree of protection in the event of an accident. Keep you comfortable in hot or cold or wet weather. Help make you visible to other road users. • Maintain your machine to ensure it is safe, legal and roadworthy. Regularly inspect your tyres for wear and damage, and make sure they are inflated to the correct pressure. • Riding on estate pathways or playgrounds, riding bikes late in the evening and racing bikes, is antisocial behaviour. If you are caught riding in an antisocial way there are a number of actions the police and councils can take including prosecution, vehicle confiscation and a criminal record.